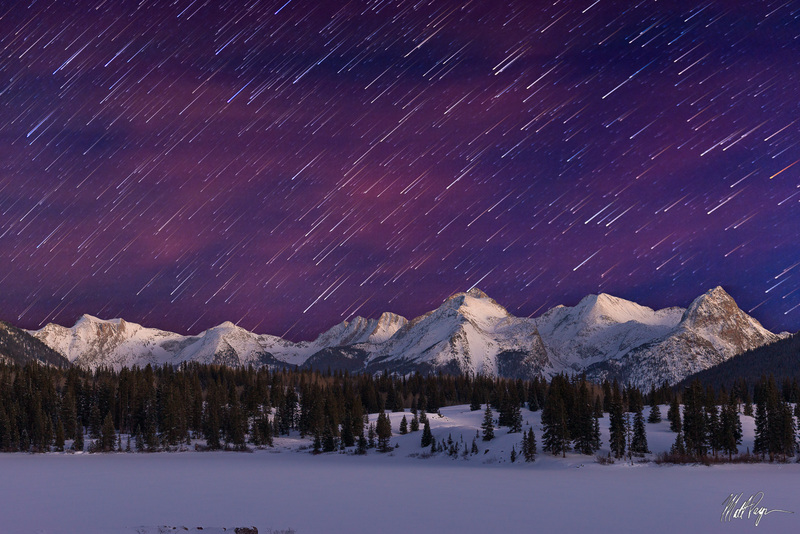 In my first month of living in Durango, Colorado, I took a trip to Molas Lake north of Durango to get some photographs of the Grenadier Range at sunset and at night. The Grenadier Range is my absolute favorite in Colorado and includes the impressive summits of Arrow Peak, Vestal Peak, and the Trinities. I had some really interesting airglow as well as some awesome views of the stars. I started with a very long exposure at f/11 for 2 minutes using long exposure noise reduction for the foreground. I then shot about 30 sequences at 30 seconds each for the star trails at f/2.8 and 52mm and edited them in such a way as to make them appear like they are meteors falling above the mountains in the sky.